This Blog was created by Students of ME (Industrial Design) Punjab Engineering College University of Technology (P.E.C) Chandigarh Batch 2011. The mission of this Blog is to maintain a friendly and inspirational social environment, where a wide range of inspirational resources are shared with pleasure. It's great to see your commitment and enthusiasm. We shall be able to complete the project by 10th Nov 2011. I always knew you all are a hardworking batch. Industrial Design which is principally the discipline of design for mass production has truly come of age in India. The country has begun to develop its own design sensibility that is gradually finding acceptance the world over. In recent times, Industrial design in India has gained prominence across various industries and is considered a key differentiator for any brand to succeed in a cut-throat market environment. Nowadays every industry, be it an automotive, Telecom, retail, pharma or healthcare, has started incorporating it into their DNA to bring about a radical information and attain high growth. Today, design is not just a prerogative of big multinationals that have always fostered a strong design culture in their organisation. Even regional brands understand the role of design and how it adds value to their overall brand. This is primarily because India is a diverse country with regional preferences that cannot be commonised. Therefore, Design is the only strategic tool that will help the brands resonate with consumers and stay relevant in a highly competitive market. In the past few years, India has expressed a perceptible interest in Industrial design. In fact, Innovation that has emerged from the design of a product has not only highlighted the USP(Unique Selling Proposition) of the brand, But also helped companies like Hindustan Unilever, Cavinkare, Tata Motors, Mahindra & Mahindra, Emami, Titan and Godrej view Industrial Design as strategic function in the entire product development lifecycle. The investment in design services has escalated exponentially in the past five years. This has furthur been fuelled by the need to design exclusively for the large botton of the pyramid (BOP) segment and India’s ever increasing global presence. Tata Nano is a classic example of how Indian design has completely revolutionised in the automotive sector, form the design point of view. 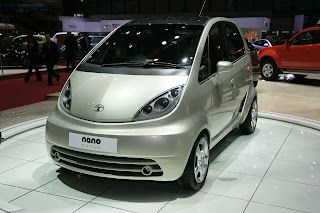 Nano responds to the crucial Indian design issue of affordability, safety and human dignity. Designing in affordable means of transport for an average Indian family commuting on two-wheelers is no mean challenge. Tata Nano offers an affordable design solution to meet a common man’s transportation need. It also stimulates the Indian design community to think out of the box and look at a car not just as style statement,but as a functional, safe, technologically appropriate and aesthetically pleasing product. ’Titan Edge’ the World’s slimmest watch and the Nokia 1100 phone are also the examples of how design has helped business succeed and enabled them to become market leaders in their respective industries. The introduction of I-mark, a quality tag that recognises and rewards good product designs. There are several factors responsible for the emergence of industrial design in India, which has helped it become a integral part of any new brand development. India’s growing economy and increased consumer purchasing power has put a lot of pressure on brands to outperform each other at competitive costs to keep their margins intact. This has resulted in the proliferation of design services as a strategic tool for business transformation. This has been backed by the emergence of instiutions like National institute of design (NID), Industrial design Centre (IDC), India Institute of technology (IIT) and Obviously PEC University of technology ;) that have generated a large design pool, which is necessary to meet the growing industry requirements. Moreover India’s strength in technology has allowed the optimisation of the product development lifecycle through design, which has enabled companies to meet today’s complex business challenges. This has also led to India emerging as a strong R&D destination providing services ranging from research to design implementation. Quite a few companies has set up a their in house design studios in India and have brought with them best practices and knowledge of creating innovative designs. Therefore the benchmark for good design has gone up by several notches. The government has taken up initiatives to promote design including the creation of the design policy in India as well as establishment of the India Design Council. This will help the industry propagate good design and create awareness of its positive impact, which can help uplift the Indian society. This will in return have a positive cascading impact on design education as more students will be exposed to this discipline. Also many international design firms are setting up shops in India, which will influence in the design industry as a whole. In addition, organisations will continue to invest in industrial design; thereby increasing the valuation of their own brands. Subsequently, India will become one of the preferred destinations for design outsourcing because of its talent and ability to produce good designs optimally. The role of Indian design firms would continue to change from doing execution work to creating intellectual capital for international as well as local companies. These design firms will help companies drive transformation through design. Lastly, in the future design firms will also look at royalties and design licencing as a way to compensate for design services. With all these current developments and adaptations, India surely has the potential to become the next design hub soon. in their formal, technological and usage aspects. study of human beings and the environment where they work. to achieve a technical and humanistic synthesis that focuses the training on creativity. - Designers of everyday-use objects, home appliances, tools, transport, etc. - Advisers, technicians or planners in industries, governmental entities or private studios. The elements and principles of design are the building blocks used to create a work of art. The elements of design can be thought of as the things that make up a painting, drawing, design etc. Good or bad - all paintings will contain most of if not all, the seven elements of design. The Principles of design can be thought of as what we do to the elements of design. How we apply the Principles of design determines how successful we are in creating a work of art. Line can be considered in two ways. The linear marks made with a pen or brush or the edge created when two shapes meet. A shape is a self contained defined area of geometric or organic form. A positive shape in a painting automatically creates a negative shape. Size is simply the relationship of the area occupied by one shape to that of another. Texture is the surface quality of a shape - rough, smooth, soft hard glossy etc. Texture can be physical (tactile) or visual. Gradation of size and direction produce linear perspective. Gradation of of colour from warm to cool and tone from dark to light produce aerial perspective. Gradation can add interest and movement to a shape. A gradation from dark to light will cause the eye to move along a shape. Repetition with variation is interesting, without variation repetition can become monotonous. The five squares above are all the same. They can be taken in and understood with a single glance. When variation is introduced, the five squares, although similar, are much more interesting to look at. They can no longer be absorbed properly with a single glance. The individual character of each square needs to be considered. If you wish to create interest, any repeating element should include a degree of variation. Contrast is the juxtaposition of opposing elements eg. opposite colours on the colour wheel - red / green, blue / orange etc. Contrast in tone or value - light / dark. Contrast in direction - horizontal / vertical. The major contrast in a painting should be located at the center of interest. Too much contrast scattered throughout a painting can destroy unity and make a work difficult to look at. Unless a feeling of chaos and confusion are what you are seeking, it is a good idea to carefully consider where to place your areas of maximum contrast. Harmony in painting is the visually satisfying effect of combining similar, related elements. eg.adjacent colours on the colour wheel, similar shapes etc. Relating the design elements to the the idea being expressed in a painting reinforces the principal of unity.eg. a painting with an active aggressive subject would work better with a dominant oblique direction, course, rough texture, angular lines etc. whereas a quiet passive subject would benefit from horizontal lines, soft texture and less tonal contrast. Unity in a painting also refers to the visual linking of various elements of the work.